Newly refurbished, the Biagio Restaurant Group introduces the latest in fine dining and Italian coffee and drinking to London Piccadilly. Basement and Ground floors present Pascucci, bringing the Italian culture of Coffee to the heart of London. 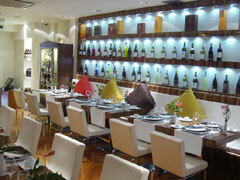 The décor is modern, stylish Italian with an Oriental influence that creates an elegant and stunning effect. This is an ideal place to enjoy an espresso and sambuca whilst reading the papers or catching up with friends. Located on the first and second floors Biagio presents fine dining in Piccadilly, presenting the newest menu to the group and dining under the stars. . Tastefully decorated Philip Starck chairs and padded white private booths transform the restaurant into a chic and stylish dining area. There is a glass atrium, which makes for a rather romantic nighttime setting. At the Caffe the menu is truly Italian choice from freshly made panini, lasagne and crespelle to a wide range of home made pastries prepared onsite by their pastry chefs. This extends to a fully licensed menu ranges from your basic espresso, to fraspuccio caramel and an extensive range of exotic coffee based drinks. There is also a full alcoholic bar. Well-known faces from the nearby National Film Institute occasionally appear here. At the Ristorante best selling dishes are the pastas and seafood, especially the salmon, cod, monkfish and King prawn platter. A wide range of freshly made panini's and pastries are available from 10 am onwards and are the perfect accompaniment to the real authentic Italian coffees that Pascucci prides itself on.